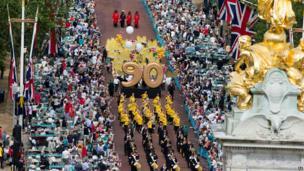 Three days of events mark the Queen's official 90th birthday celebrations. The Queen's official birthday - held seven weeks after her actual 90th birthday - have been marked by three days of celebrations. 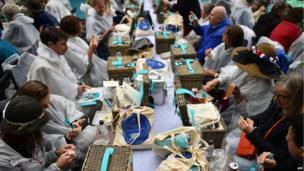 On Sunday, up to 10,000 people attended a picnic lunch on The Mall, outside Buckingham Palace. The Queen, naturally, had the best seat to watch the carnival featuring performers from some of the charities she is the patron of. 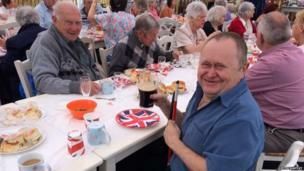 The street party was held on Sunday afternoon. 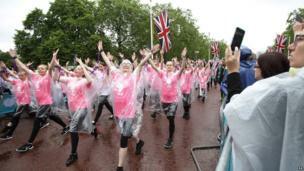 The rain did not dampen the spirits of the performers. 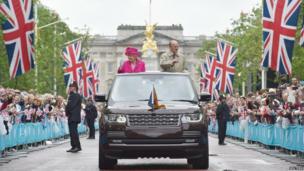 The open-air event was organised by the Queen's grandson Peter Phillips. 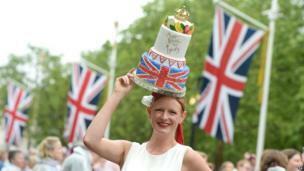 People donned costumes adorned with the Union Jack in as part of the birthday festivities. 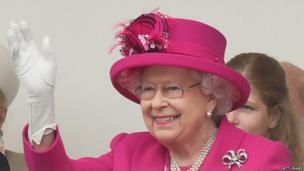 The Queen was serenaded down The Mall as thousands sang Happy Birthday. 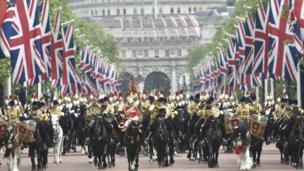 Members of the Royal family, including the Duke and Duchess of Cambridge and Prince Harry, took part in the celebrations by greeting well-wishers on The Mall. Prince William also gave a speech where he praised the Queen for her hard work and dedication to charities. 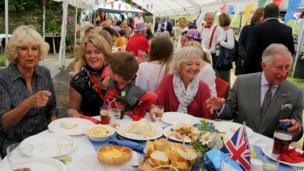 Meanwhile, Prince Charles and the Duchess of Cornwall attended a street party in Brimpsfield, Gloucestershire. 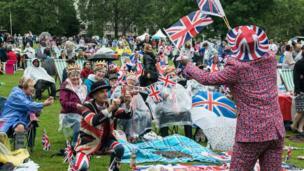 In nearby St James and Green parks, thousands have held their own picnics in honour of the Queen. 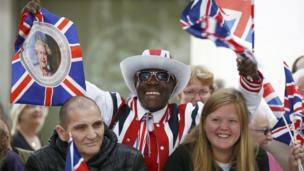 Joseph Afrane, 52, seen here dressed in Union Jack clothing, waves flags in Green Park. 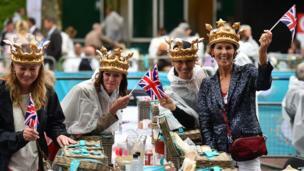 Guests paid £150 each to attend the official Patron's Lunch. Security was tight, and the guests had to go through body scanners before taking a seat at the picnic tables. 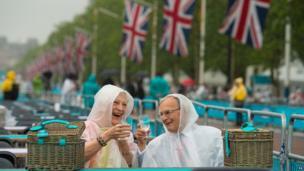 Margaret Tiler and David Jones from Wembley, north London, braved the rain to attend the party. Street parties were being held across the country. Kevin, pictured on the right, was among those who celebrated at Bevys pub in Brighton. 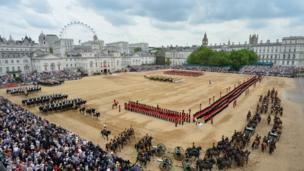 The opening event on day two was the annual Trooping the Colour in Horse Guards Parade, a short carriage ride from Buckingham Palace. 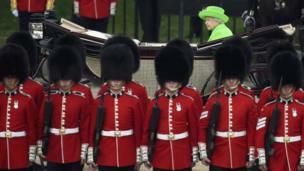 Dressed in a bright lime green coat and matching hat, which was adorned with cerise-coloured flowers, the Queen waved to crowds as she left Buckingham Palace to watch the parade, in which she "inspects" the military forces serving the country. 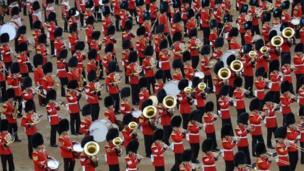 The Queen has attended the annual Trooping the Colour every year of her reign, except in 1955 when a national rail strike led to the event being cancelled. 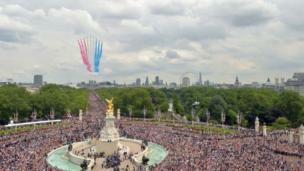 The RAF fly-past roared down The Mall and over the top of Buckingham Palace to cheers from the crowd below. 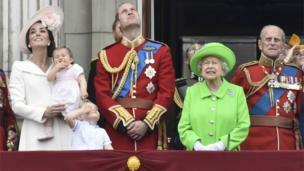 The Duke and Duchess of Cambridge, Prince George and Princess Charlotte appeared alongside the Queen and the Duke of Edinburgh to watch a fly-past on the balcony of Buckingham Palace. 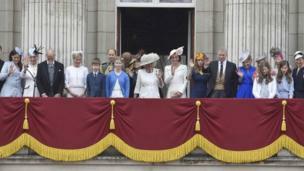 Other members of the Royal Family also appeared on the balcony to wave at the swelling crowds of spectators below. 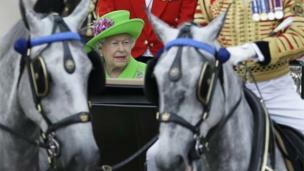 The Queen has two birthdays - the official one on a Saturday in June, and her real birthday on 21 April. In a tradition going back 250 years, the official birthday was introduced to try to ensure better weather for the celebrations. 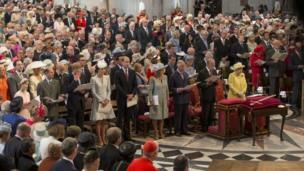 On Friday a national service of thanksgiving took place at St Paul's Cathedral in recognition of the Queen's 90 years. 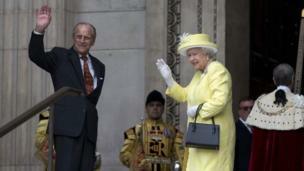 Friday also marked the birthday of the Duke of Edinburgh, who is 95. 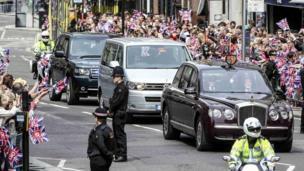 On this occasion the Queen, dressed in yellow, and arrived at the venue to cheers from the crowds outside, and a fanfare of trumpets. The Queen has been married to the Duke of Edinburgh for 68 years - she was the first reigning British monarch to celebrate a diamond wedding anniversary. In 2012 she became the second British monarch to celebrate a diamond jubilee, and in 2015 became the UK's longest reigning monarch. 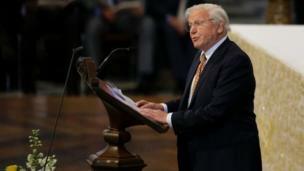 About 2,000 people attended the service, including several members of the Royal Family, politicians and other nonagenarians, including Sir David Attenborough and the creator of the Paddington Bear series, Michael Bond. 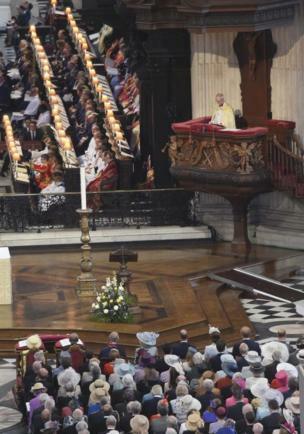 The service was led by the Archbishop of Canterbury, the Most Reverend Justin Welby, who said that we would look back at the Queen's 90 years with "deep wonder and profound gratitude". 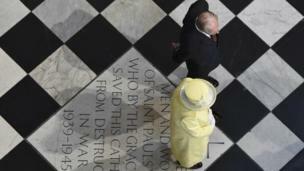 Archbishop Welby also said the Queen had sustained the country "through war and hardship, through turmoil and change". 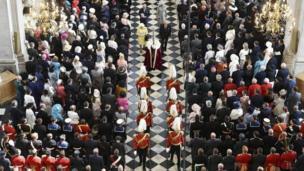 More than 50 members of the Royal Family were at St Paul's for the service. 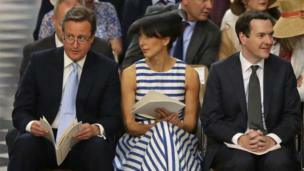 The Prime Minister David Cameron - who gave a Bible reading - was accompanied by his wife Samantha and Chancellor George Osborne. During the service Sir David Attenborough, who turned 90 on 8 May, read Reflections on the Passing of the Years written by Michael Bond. 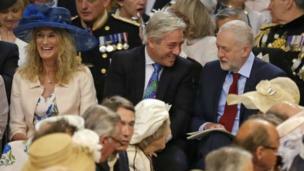 Commons Speaker John Bercow shared a joke with Labour Party leader Jeremy Corbyn, both of whom were among the congregation. 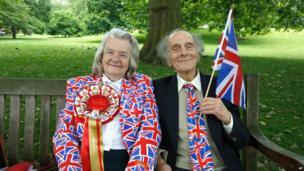 Members of the public, some dressed in Union Jack flags, gathered outside the cathedral for the occasion. Following the service, the Queen hosted a lunch at Buckingham Palace for visiting governors-general - those who represent her in independent Commonwealth realms. 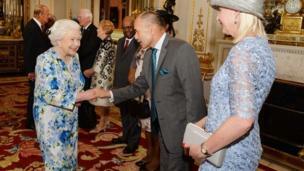 Here she can be seen meeting New Zealand's Governor-General Jerry Mateparae. 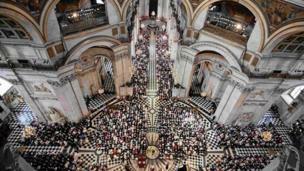 But the celebrations were not contained to just St Paul's. 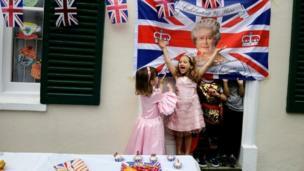 At L'Ecole des Petits in London, pupils also dressed up to celebrate the Queen's milestone. Queen's 90th birthday: How is her milestone being celebrated?